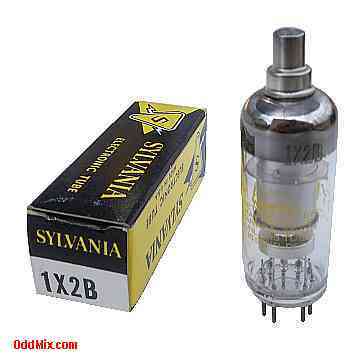 This is a genuine Sylvania 1X2B electronic tube in it's original box. These 9-pin miniature all glass tubes typically used as pulsed half wave rectifiers to provide multi kilovolt anode voltage for television (TV), X-Ray emitter, photomultiplier and special purpose circuits. Excellent for various restoration projects or to set up a private vacuum tube museum. It is a NOS tube - New Old Stock, unused, boxed, and kept for all these years in mint condition.